Martingale Wharf, by its own admission, is an American bistro. Aren't bistros small and modest with simple food? With a deck and three dining rooms, not so much, Martingale, but all American, you bet. 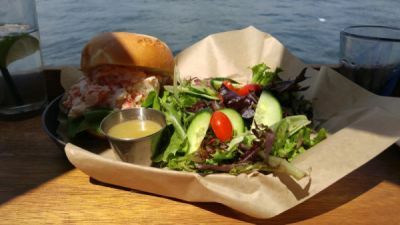 No cassoulets or stew but who cares with chowder, crab cakes, scallops, ribs, fried chicken, burgers, wraps and lobster rolls that make lunch on the water the best. There's no cooler place in the city when it's 90. We know. 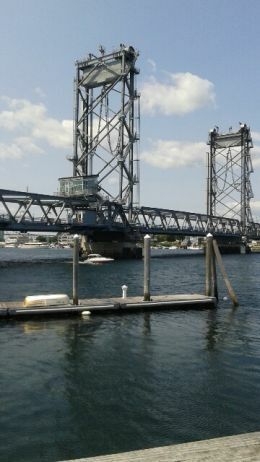 Martingale overlooks the Piscataqua River in downtown Portsmouth with the location card all sewn up. We want outside and the tables are full, so we're at the bar. The bar seats face the water. They face the water and they are over the water. It's not a place for phones or the queasy; whatever falls is toast and gone. We lose a menu. 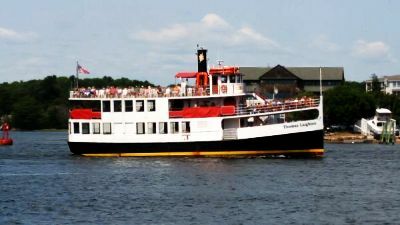 The water's soothing: the bridge to Maine, tour boats, diving birds and sailors. The water chop, thanks to a brisk wind, curbs the appetite. I'm hoping I don't fall off my chair. Everything is moving. It's unusual seating. Try it. Roseanna opts for the chef's Cuban: pork shoulder, Swiss, pickles, mustard, plantains all grilled on ciabatta. Hannah, our polished server, comes back from the chef with a long face: no Cubans. Roseanna is thinking . . . over a drink. Sure, the drink of the day is a blood orange margarita. It's silver tequila, lime juice, Cointreau and red, red orange. She says she's been waiting all summer for the right time. (I think every night is the right time for a margarita.) She tells Hannah the smoked brisket sandwich will work. Soon Hannah is back from the kitchen with a long face: no brisket. Hey, it's only Monday. In the end we both order lobster, which is hardly settling. So it's two lobster rolls, one gluten-free. The lobster's right off the boat with mayo and that's it. My roll, the purist traditional, is grilled (below) and warm. The lobster matches but the look's different. Gluten-free (top) is thicker and no one ever thinks about throwing gluten-free carbs in the toaster. It needs it. The salad's vinaigrette is vinegar to the nth, go Italian. I wish for fries. I order salad. Still, summer salad's got avocado for a buck and it's ice cold. We're all the better for no fries. Which also means no crème brulee, no limoncello custard, no mousse, no hot fudge. Yes, we're better. 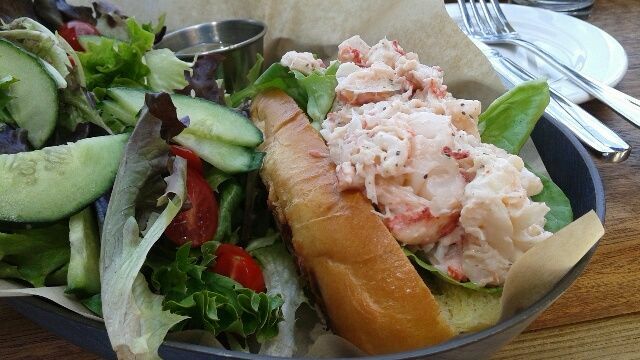 And glad to get in another lobster lunch. Today may be a trend; no Cubans or brisket on the menu. Or it was it a busy Sunday? Ask about their local suppliers: Sanders Fish Market, Meadow's Mirth, White Gates Farm, Jessica's Brick Oven, Favorite Foods among others in New Hampshire. Much lunch is around for dinner. Plus dinner's got specials. So you could have what we're having, so long as it's not brisket. Catch entertainment Friday and Saturdays, and Restaurant Week's in November. Portsmouth's got year-round things to see and eat. Summer's great but how about frosty nights when it's clear, and toasty inside. Never mind, let's not think about frost. Anyway, you will not be bored. 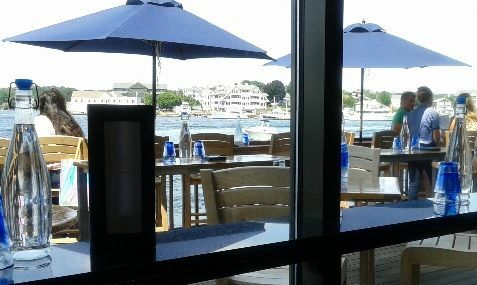 Martingale will be here at water's edge with lobster rolls galore. Outside for now, inside, later; watch for wakes.